Downwards movement for FTSE continues as expected. 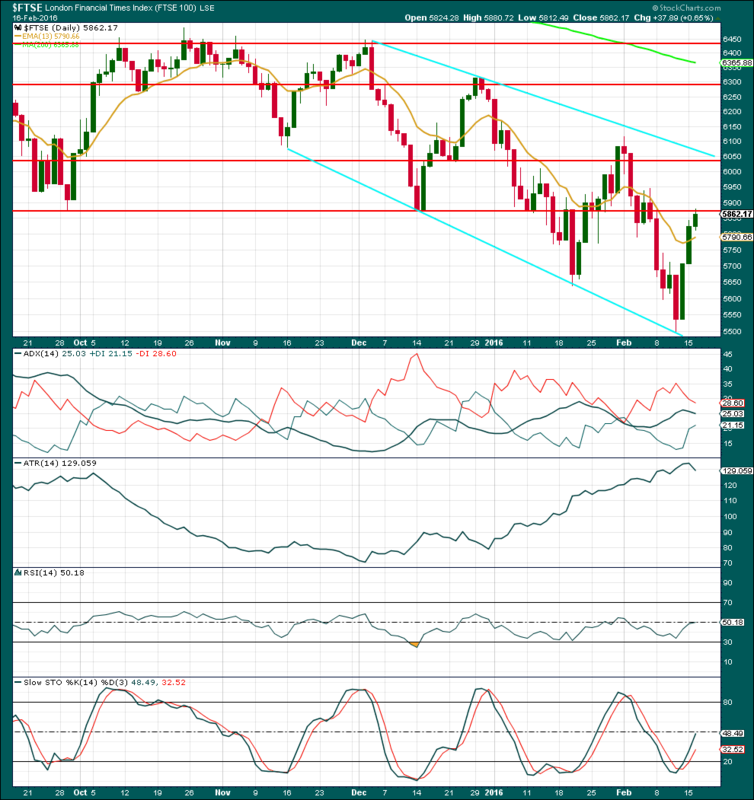 Upwards corrections remain within the base channel as expected. Summary: There may now be five overlapping first and second waves for FTSE. This indicates an explosive downwards movement may be ahead. The mid term target remains the same at 4,296. 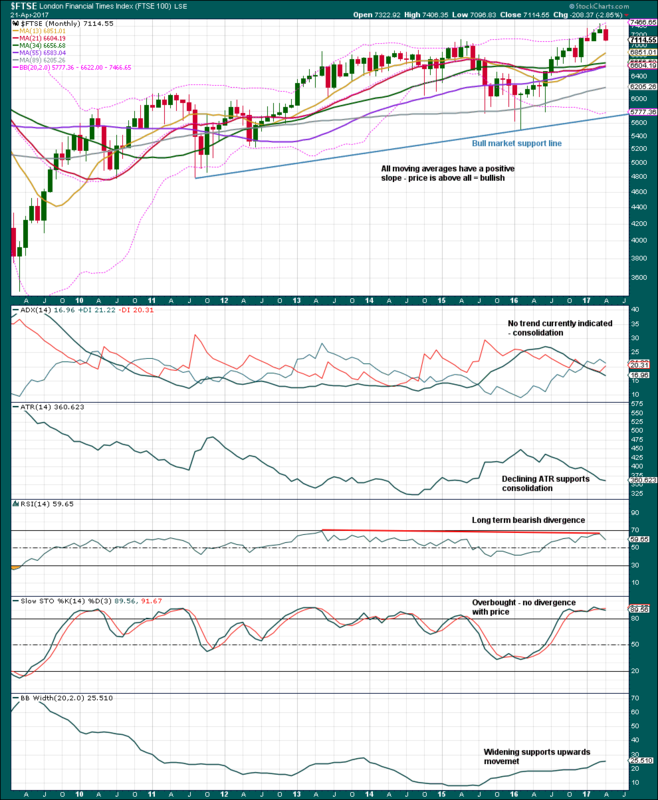 The risk is at 6,115.10, or the upper edge of the green channel on the daily chart. 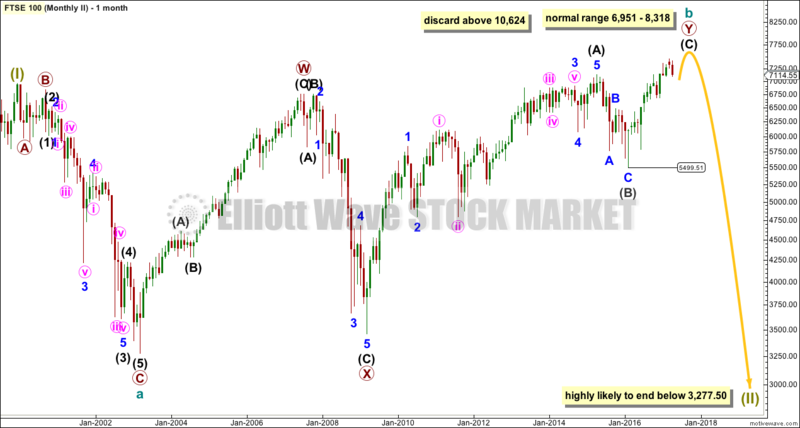 The Elliott wave count is supported by technical analysis. 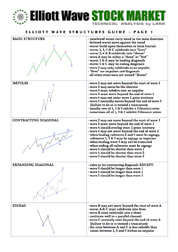 To see monthly and weekly charts and the bigger picture see last analysis here. Price has now made a new low below the August low at 5,768.22. Downwards movement should continue. 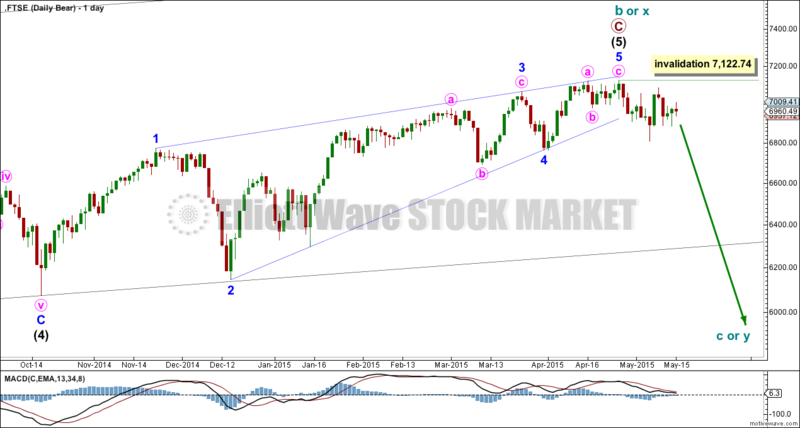 So far the middle of the third wave cannot have passed for FTSE. 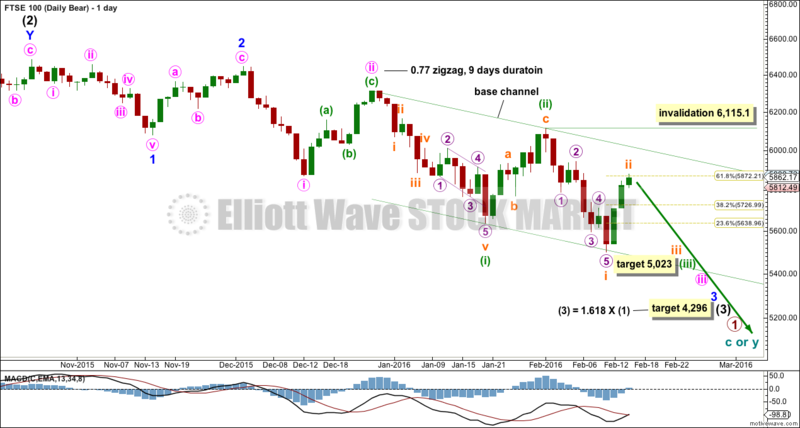 Upwards movement labelled minuette wave (ii) is back in minute wave i price territory. 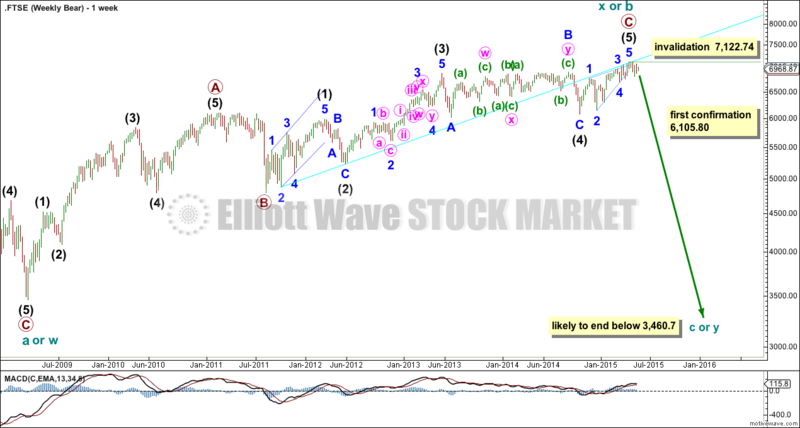 This cannot be minute wave iv, so it may only be yet another second wave correction if this wave count is correct. 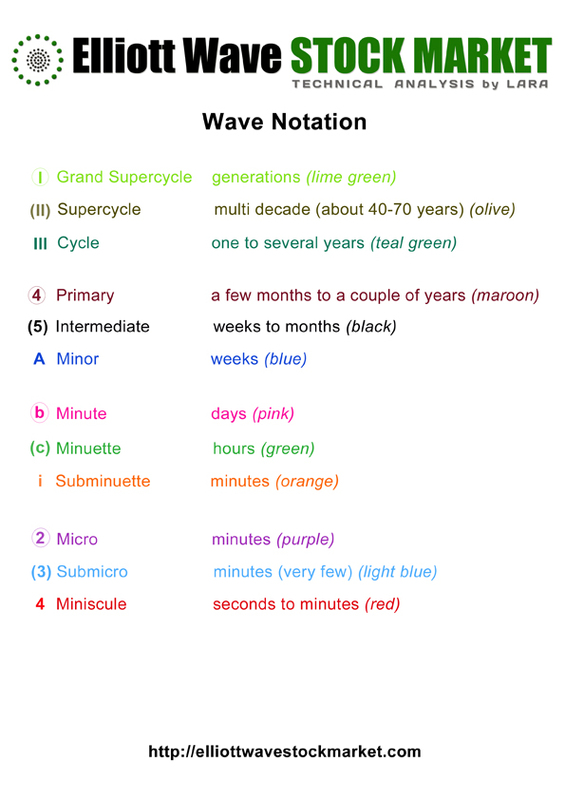 Within minuette wave (iii), yet another first and second wave may be complete for subminuette waves i and ii. Again, subminuette wave ii is in the price territory of the first wave one degree higher, so this upwards movement may not be minuette wave (iv). 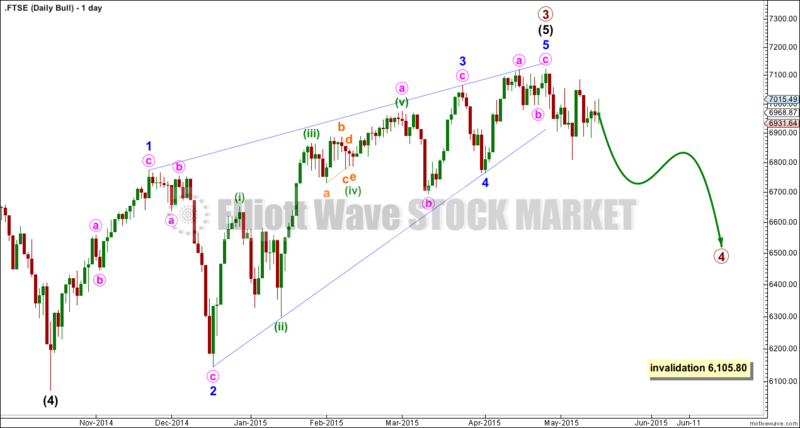 If this wave count is correct, then this may only be yet another second wave correction. 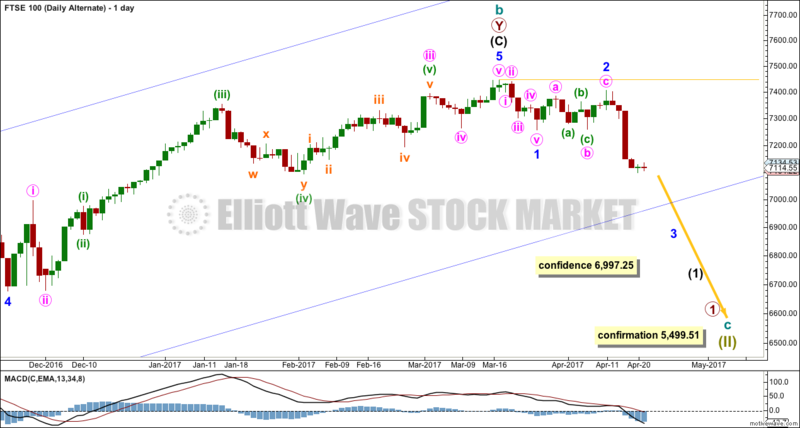 Subminuette wave ii has reached up to the 0.618 Fibonacci ratio of subminuette wave i which is about 5,872. It would be very likely to end here. If it does end here, then it would have taken a Fibonacci three days duration. 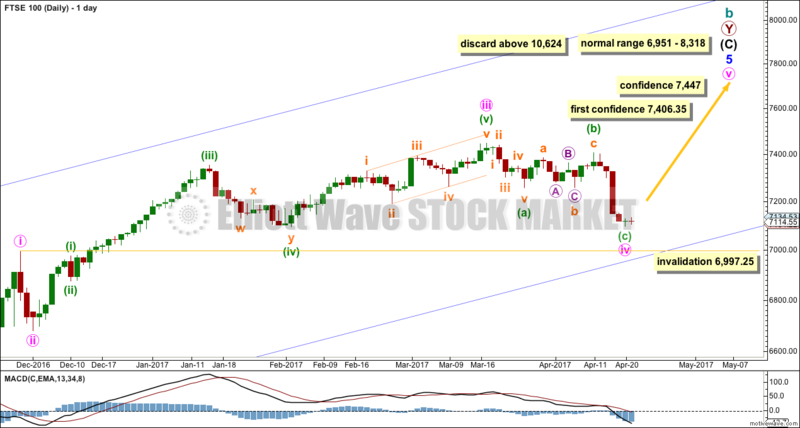 The pattern of each successive second wave correction being more brief than its predecessor should be expected to continue. If subminuette wave ii continues any higher, then it should find resistance at the upper edge of the base channel drawn about minuette waves (i) and (ii), one degree higher. The volume profile for FTSE continues to be more bearish than bullish. As price fell to the last low of 11th February, it came with some increase in volume. The fall in price was supported by volume. As price rose on 12th and 15th February, it came with declining volume (Yahoo Finance volume data for 16th February is not yet available). This indicates the rise in price was not supported by volume. 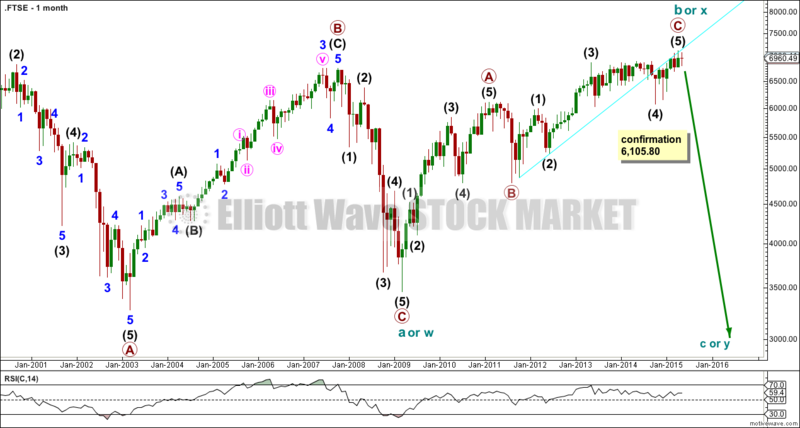 This supports the Elliott wave count. The last three daily candlesticks complete a stalled pattern, a variation of three white soldiers. While three white soldiers is a reversal pattern, when the third candlestick is small and follows two tall white candlesticks (here they are green) then it indicates the power of the bulls is weakening. This pattern sometimes precedes a decline. 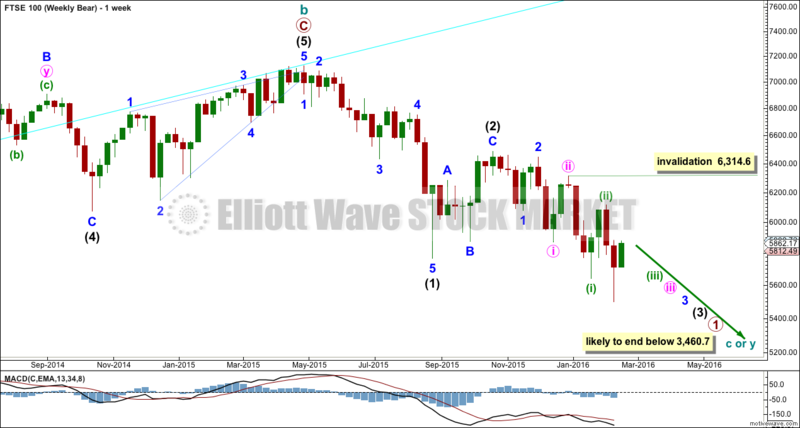 This supports the Elliott wave count. 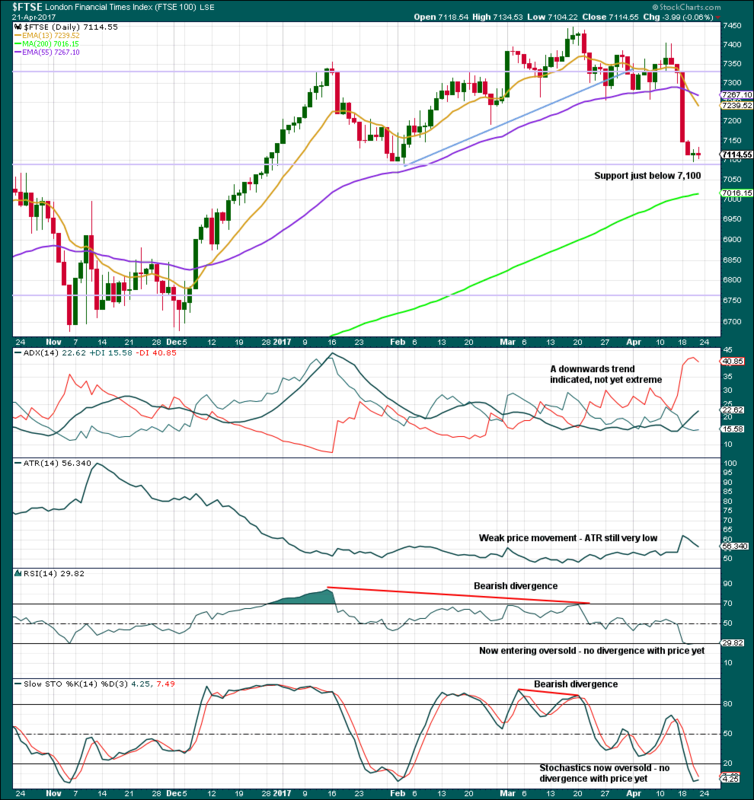 ADX is declining, so it indicates the market is no longer trending. It does not indicate there has been a trend change though; the -DX line remains above the +DX line, so if the trend returns it should still be down. ATR is overall still increasing. This indicates the market is still likely trending. The last three days of upwards movement from price has bought RSI back up to neutral. There is plenty of room for this market to rise or fall. Stochastics is returning from oversold. 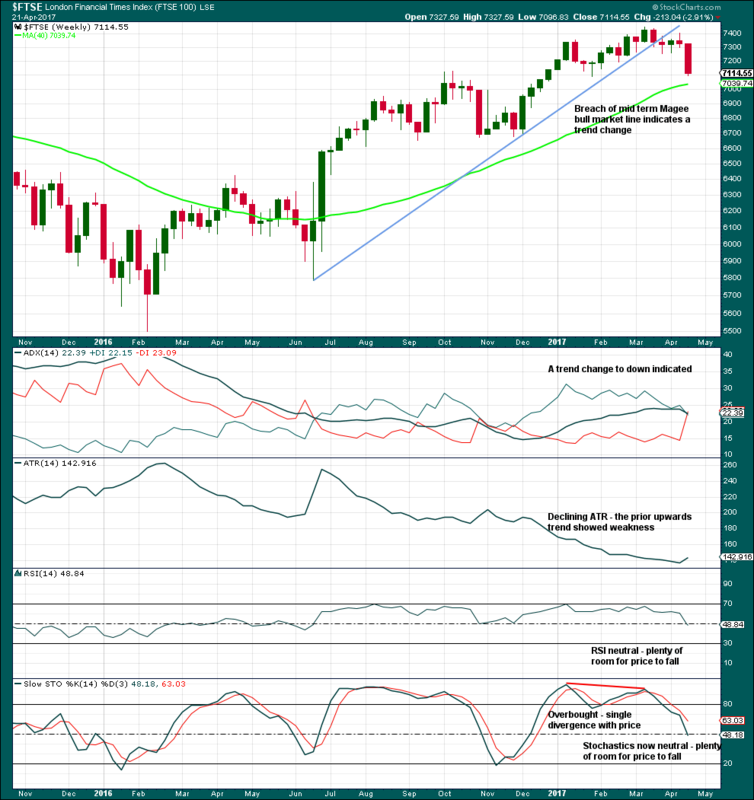 There is some divergence between the last two swing lows in price and the corresponding lows on Stochastics: while price made a new low Stochastics made a higher low. This indicates some weakness in price. I have learned the hard way though to not give this divergence between price and Stochastics too much weight. On its own, it is just a weak bullish signal. 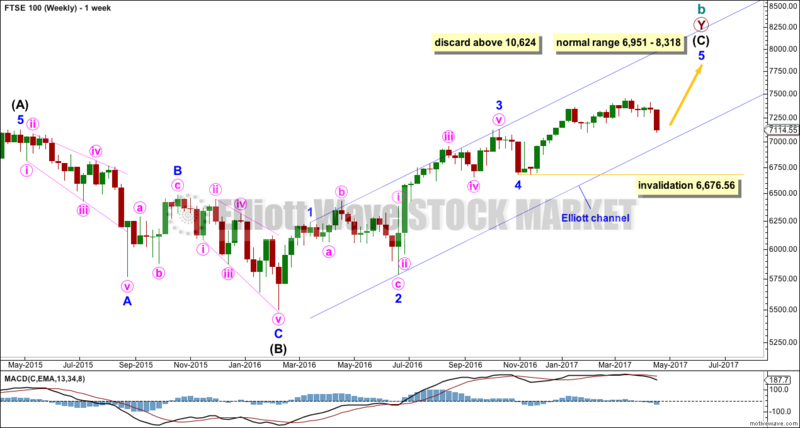 There is no divergence between the high of 16th February and the last swing high of 1st February; as price made a lower high, so did Stochastics. A new low below the August low of 5,768.22 was required and expected. This week’s FTSE analysis is for members only. To subscribe click here. 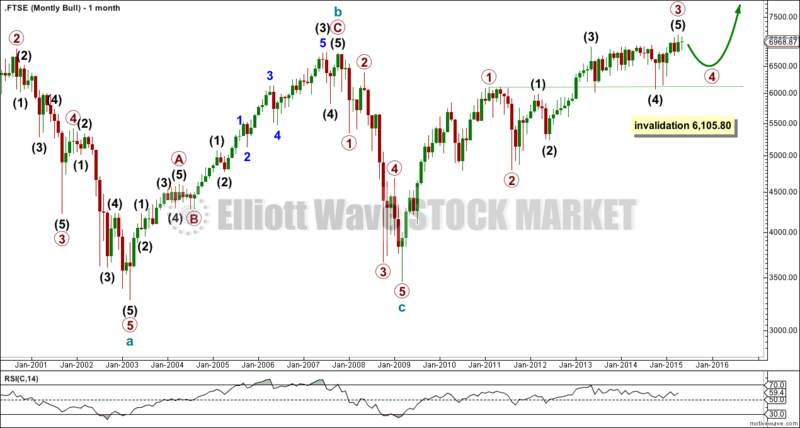 There is only one Elliott Wave count for FTSE.